Paul Antony Jones is the first “formerly” self-published author that I met when I started my own journey into writing. He has come a long way since then and serves as an inspiration. He truly defines the essence of a “successful” writer, having attracted the attention of Amazon with the self-publishes success of the first book in his Extinction Point series, Extinction Point. You can read my review of the first book in the series HERE. His model of success is simple. Write the best damn book you can, in a genre filled with hungry readers. He truly hit the mark. 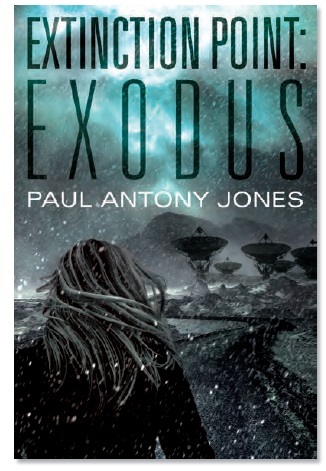 “Exodus, the long awaited second book in Paul Antony Jones’ Extinction Point series takes his sweeping apocalyptic vision to the next level. The reader catches up with Emily, as she heads north along the Hudson River, on the first leg of her journey to reach Alaska and rendezvous with the only other known group of survivors in North America. Guided by an astronaut aboard the International Space Station, Emily’s trip takes on sudden urgency, when she learns that a massive “red” storm rapidly approaches the eastern seaboard. With her trusty canine companion and an unexpected addition to her entourage, Emily battles her way west and eventually north, trusting that salvation lies at a remote station, on an island off the Alaskan shore. Jones descriptions of the alien phenomena left me spellbound and frightened. The tree pod creatures in particular are horrifyingly marvelous, unlike anything I’ve ever read. The “red” terraforming is taken to an entirely new level with massive weather events witnessed from low earth orbit through a unique viewpoint. The alien lifeforms’ resilience is tested in colder weather, lifting the fog of hopelessness just enough to shine a light on the hope that humanity might have a chance of escaping extinction. I noticed a significant shift in the author’s writing since Extinction Point. One of the most common complaints revolved around the exhaustive descriptions. Jones has trended away from this, and I didn’t detect any superfluous or extraneous exposition. The action was realistic, given the character’s capabilities. I think that Mr. Jones took this criticism to heart and made an excellent adjustment to the style he has adopted for the series. Exodus similarly benefited from an improved flow. For such a “lonely” and linearly progressing story, involving a minimal number of characters, the pace at which the characters move along on their journey toward their destination in Alaska is believable and well timed. The mechanics of Emily’s travel work superbly in this novel.